Explore the history of advertising! Episode 6 presents questions, answers and commentary about the messages advertisers create to persuade the public to buy their products. It's a fun and memory-evoking program posing questions about advertising. There are excerpts of lots of ads for products that viewers are sure to remember. 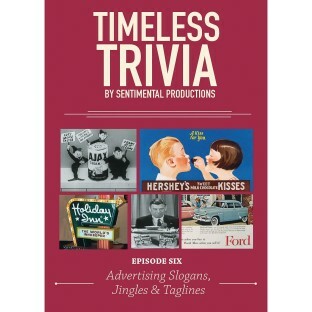 Episode 6 features: Advertising Slogans, Jingles & Taglines. There are 50 questions divided into 5 separate segments. There are 50 questions divided into 5 separate segments; Advertising Spreads the Word, Radio’s Golden Age, TV’s Persuasive Power, Famous Slogans & Jingles; Memorable Automobile Ads. If you want everyone to follow along as the questions and answers are presented, it also includes a separate CD with printable materials (questions, answer key, plus 25 bonus questions and answers!). Run time: 40 minutes.